My hubby and I were able to put the almost final touches on the landscaping for the front of our new home this weekend after a visit to my uncle’s farm and his Japanese Maple nursery – Quail Hollow Gardens. 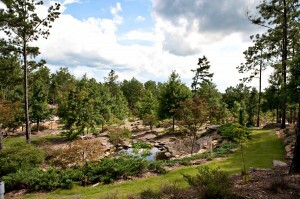 Located on Crooked Oaks – Pat Dye’s home, farm and hunting grounds – the property could as easily be called a nature preserve. We took John and Kristi – friends of ours who also graduated from Auburn and were students in the 80’s while Pat coached there. The Japanese maples are a passion he’s been cultivating for many years now. 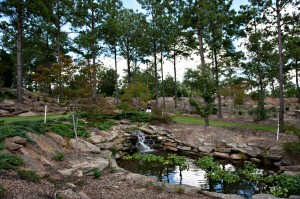 The show room is a 250-yard recirculating waterfall decorated with various types of Japanese maples – every size, shape, height and color you could imagine. He has more than 150 varieties on the farm. 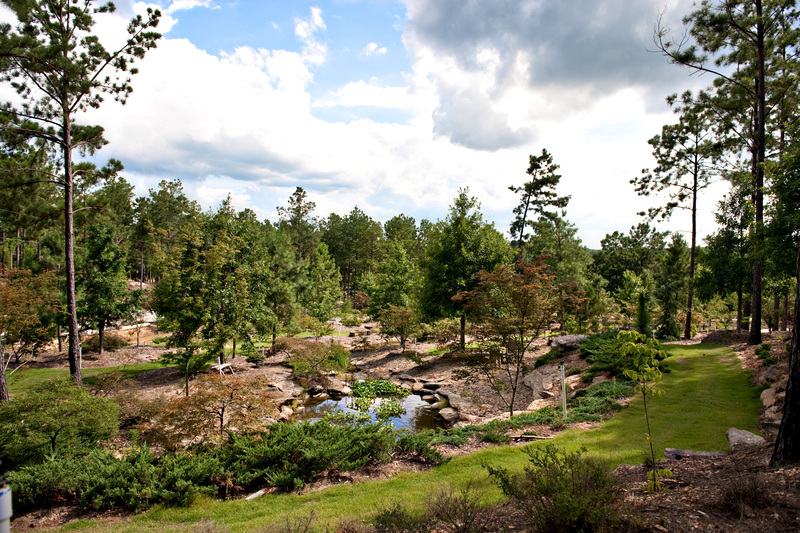 Below the native pine canopy, in addition to the maples, he’s fostering groves of native azalea, camilla, hydrangea and rhododendron – a Southerner’s paradise. We went equipped with pictures of our house in hand so that he could coach us on what type of tree would be best in the spot we had picked out. He suggested an upright – a variety that will grow to about 25 feet tall – and suggested one of three specimens. We settled on the Bloodgood. While looking through the container trees, hubby fell in love with a dissectum , the type of Japanese maple that doesn’t get as tall, but tends to grow laterally and has leaves split into five thinner pieces. We decided to get this Garnet as well, for another bed in our front yard, closer to the house so without quite as much sunlight. In addition, Uncle Pat suggested two smaller green dissectums, one for either side of the upright. So we went for one and came home with four! All are in the ground and look fantastic. 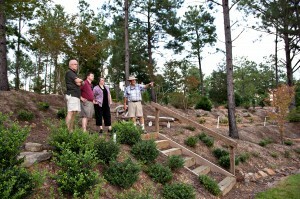 We are so excited about having at least the plantings complete for our front yard. 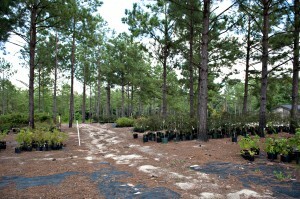 If you are interested in learning more about Coach Dye’s Japanese Maple nursery – Quail Hollow Gardens – check out his website. There are pictures of a number of his more popular species, as well as a cool slide show of pictures of the building of the waterfall (go to “About” and the link to the slide show is at the bottom of the page). With more than 5,000 available for purchase, a Japanese Maple from Coach Dye is the perfect birthday or Father’s Day gift for anyone – but in particularly an Auburn fan. WDE! Okay now we need some pictures of the trees in their new home. That first shot should be framed on a wall! I’m not sure I would have left that place its so relaxing.